Planning to buy a used car for your day to day commute? Not sure about the right price to pay? Worry no more! Droom – India’s first and largest marketplace for automobiles, has launched Orange Book Value. It is India’s first algorithmic pricing engine to measure the fair price range for any used automobile. Used automobile segment is rapidly evolving and holds out amazing potential for business firms, but it is plagued by uncertainties, mismanagement and an ambiguous pricing mechanism which is often subjective and mostly dependant on the seller’s discretion. Unlike a ‘new’ vehicle that comes with a standard price, the pricing of a pre-owned vehicle is dependent on various parameters like condition of the vehicle, kilometres driven, etc. Droom’s Orange Book Value is technically advance engine that does comprehensive algorithmic calculation to give you a fair market for the vehicle you are willing to buy. 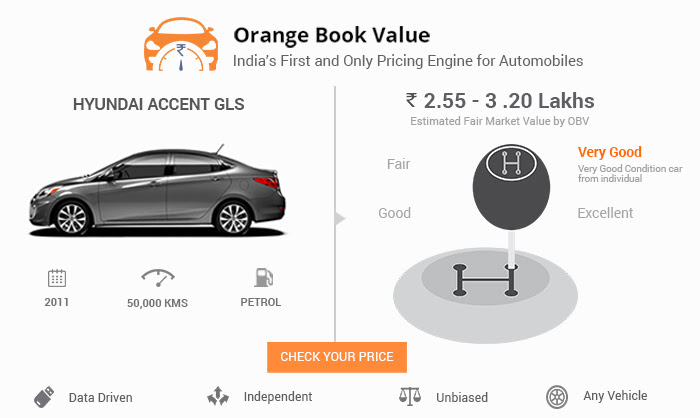 Orange Book value (OBV) is India’s first algorithmic pricing engine to calculate the fair market value of any used vehicle. Right valuation of a pre-owned vehicle has always been a strenuous task for both buyers and sellers and OBV has been especially designed keeping this in mind. The long term vision of developing OBV has been to determine the valuation of every vehicle on Droom – from bicycles to planes. A seller can refer to the OBV while listing a vehicle, while a buyer can refer the OBV when purchasing a used car, motorcycle, or more. You can also take advantage of Orange Book Value to know the price of a used vehicle listed on any other online website or offline. As a seller you can refer it to know the estimated market value of the vehicle you want to sell, as this will help you sell quickly and get maximum buyer attention. Making it available to all the online consumers, Droom is trying to make the Indian automobile marketplace more managed and organised. OBV has also been designed to be categorically agnostic and is successful in determining the fair valuation of any automobile – from bike to plane. Along with Orange Book Value, Droom also has a plethora of other such tools under Droom Discovery – ranging from Affordability Calculator to EMI Calculator to Total Cost of Ownership. Being a technology driven organization, our main focus has always been to empower users with ease and to help them experience the 21st century experience of buying and selling used vehicles online. So, before you buy your next vehicle, make sure to check the price in OBV and not get cheated by any seller.